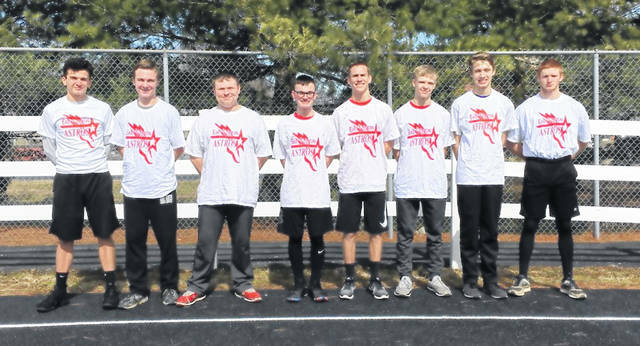 Bob Henson has several solid athletes to work with in his first year as East Clinton High School boys track and field coach. However, the numbers overall are slim and Henson realizes that will be an issue. “I like the energy that the athletes are bringing to practice,” said Henson, who has worked with EC track/field and cross country for a number of years. “Our numbers are somewhat low, but we are young which makes me hopeful for future seasons. We have some strong juniors who are setting a solid example for our younger athletes. We have several promising freshmen who will be a great asset as they adjust to varsity competition. The team is showing good attitude and spirit. Patrick Dotson, Brenda Walters, Zack Mitchell and Aidan Henson return to lead the Astros, who were sixth in the SBAAC last season. Dotson and Henson were first team All-SBAAC all-stars, the EC coach said. Henson believes his squad can contend in the SBAAC National Division with good health and more athletes, so recruiting from this point forward is ongoing. Henson said Clermont Northeastern and Blanchester are the division favorites. Newcomers Landon Runyon, Donavan Pontious, Van Frye, Justin Arnold and Peyton Garen are expected to contribute this season.